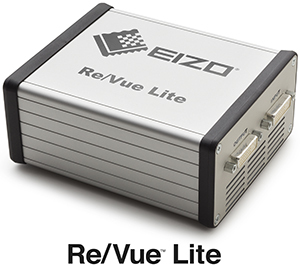 Altamonte Springs, Florida, USA, November 20, 2013 – EIZO today announced the Re/Vue Lite, an H.264 encoding and streaming device with built-in mission critical redundancy for air traffic control (ATC) and command and control (C2) environments. It supports resolutions of up to 1920 × 1200 from both analog (VGA) and digital (DVI) sources. The Re/Vue Lite provides extensive redundancy to ensure continued operation through simultaneous H.264 encoded video data streams, dual Ethernet outputs, two power supplies, and an integrated active splitter that forwards video signals to the monitor even when no power is applied to the unit. EIZO’s Re/Vue series of ATC recording and streaming solutions was first introduced four years ago and also includes the Re/Vue MG1 video and audio recorder and the Re/Vue Mini, a standalone recording component supporting lossless compression for video capture, encoding, streaming, and playback of connected monitors up to 2K × 2K. In addition to its use in ATC and C2 markets as a component of at-the-glass recording solutions, Re/Vue Lite is also suitable for other mission-critical applications including video surveillance, reconnaissance, broadcast, and geospatial intelligence. Founded in 1968, EIZO is a leading global manufacturer of high-end visual display products. The image quality, long-term reliability, and innovative features of EIZO monitors make them the products of choice in many financial trading rooms, back offices, hospitals, air traffic control centers, and design studios throughout the world. EIZO is based in Japan and listed on the first section of the Tokyo Stock Exchange. It is represented in over sixty countries by a network of group companies and exclusive distributors. All product names are trademarks or registered trademarks of their respective companies. EIZO and Re/Vue are registered trademarks of EIZO Corporation.